Terrorism atau pengganas, satu patah perkataan yang sekarang ini sering didengari di media massa. Ada sahaja perbuatan-perbuatan yang melibatkan kemusnahan dari segi harta benda dan juga nyawa yang terjadi dan most of them are being associated with act of terrorism. Malaysia telah lama diancam terrosim sejak dari tahun 1948 lagi. Pelakunya adalah pengganas komunis. Kini Malaysia diancam lagi oleh pengganas. Sebelum ini saya banyak membaca sejarah perjuangan menentang komunis dan antara perkara yang dititikberatkan dalam operasi menangkap dan menumpaskan komunis adalah ketepatan maklumat. Tanpa ketepatan maklumat, operasi yang dijalankan tidak akan berjaya malah mungkin membahayakan keselamatan polis dan tentera. Pada zaman ini, lagi sekali kita menggunakan maklumat yang ada untuk menentang dan menumpaskan ancaman pengganas. Namun, sesuai dengan peredaran zaman, teknologi-teknologi terkini boleh digunakan untuk memperolehi, menyimpan dan mengakses kembali maklumat tersebut. Dalam dunia pengurusan maklumat yang efektif, teknik untuk gather, storage and retrieve information dapat diuruskan dengan lebih teratur sehingga membolehkan information delivered at the right time, moment and to the right people. Sejauh manakah maklumat-maklumat ini diuruskan dengan baik? Itu saya tidak tahu kerana ianya sulit. Saya assume semua berjalan lancar sebab itulah kita memperolehi banyak kejayaan. Apa pun, tahniah kepada unsung heroes kita dalam pasukan keselamatan yang banyak bekorban untuk Malaysia kekal aman. Di bawah merupakan artikel penuh dari The Star berkenaan perjuangan Unit Anti Pengganas Malaysia menentang terrorism. KNOWN just as E8, the Bukit Aman Special Branch Counter Terrorism Division has been working behind the scenes since the 1990s in Malaysia’s battle against terrorism. Terrorist groups and cells ranging from al-Qaeda and Jemaah Islamiyah to Kumpulan Mujahideen Malaysia and, more recently, the Islamic State (IS) have been busted due to E8’s painstaking work. Yet a misconception has persisted about how Malaysia was used as a launch pad for the Sept 11, 2001, attack on the United States. The division could not counter such allegations because information about its work had to remain classified for security reasons. Now, finally, after files have been unclassified, the head of the E8, Deputy Comm Datuk Ayob Khan, speaks to Sunday Star to set the record straight. Can you comment on allegations that Malaysia was used as a launch pad for the 9/11 attacks on the United States in 2001, and that local authorities were unaware then of the terrorists’ presence here? This is definitely not true. In December 1999, the Special Branch received information from an American intelligence agency that nine Arabs, suspected to be al-Qaeda members, were in Malaysia. They were actually a unit that specialised in suicide attacks and bombings. Based on that intel, we tracked down one of the operatives, Khalid Al-Midhar, who entered Malaysia on Jan 5, 2000. We were tasked with conducting surveillance at KL International Airport that night. We waited at the baggage carousel area and one of the officers spotted Khalid. Based on his mannerisms, clothing and movements, I would never have thought this man would eventually hijack an airplane and crash it into the Pentagon (in Washington DC). We tracked Khalid’s movements in Malaysia, following him to Bukit Bintang (in Kuala Lumpur), where he met with three other operatives – Nawaf Al Hazmi, Salahsaed Mohamed Yousaf @ Khallad, and Suhail @ Abd Shorabi. All four stayed at a condominium in Sungai Long (Selangor) that belonged to Malaysian militant Yazid Sufaat. Khalid, Nawaf and Salahsaed flew to Bangkok and joined other terror cells to plan the 9/11 attacks. We passed all information, including passport and flight details and photographs to an American intelligence agency. Unfortunately, that agency did not share the information with other US law enforcement agencies such as the FBI. If the agency had shared the information, pre-emptive measures could have been taken by US authorities to arrest the suspects as they entered the United States. This lack of coordination was highlighted in the “9/11 Commission Report” published by the US Government after the attack. Thus, allegations that Malaysia was used as a launch pad and did not share intel with American authorities are simply false. Those who make the allegations should look at their own shortcomings first before blaming Malaysia. Was the surveillance of Khalid the first success E8 had in battling al-Qaeda? No, it’s not. In December 1995, we arrested Wali Khan Amin Shah, the man connected to the basement bombing of the World Trade Center in New York City on Feb 26, 1993. The blast killed six and injured more than 1,000 people. Our investigations revealed that Wali Khan was close to al-Qaeda member Ramzi Ahmad Yousef and that both were hiding in South-East Asia. While Ramzi was eventually detained in Pakistan, Wali Khan remained elusive. However, through intelligence exchanges and cooperation with agencies in neighbouring countries, the division managed to track down Wali Khan on Pulau Langkawi where he was attempting to open an Arabic restaurant in Kuah in June 1995. We counter-checked Wali Khan’s photograph with the FBI and confirmed his identity based on an injury to his right hand following a mishap while testing a bomb in Afghanistan. He was married but had two girlfriends – a Malaysian and a Filipina. We caught him in Kuah on Dec 11, 1995, while he was distributing fliers to publicise his new restaurant. He did not resist arrest – in fact, he was shocked, and even cried. This success prompted then US President Bill Clinton to send a letter of appreciation to our Prime Minister and the police, especially the division. Danger zone: Ayob (left) checking bomb materials seized from Dr Azahari in Perak in June 2003. Other than al-Qaeda, what other terror groups has the division successfully fought? Top of the list has to be Jemaah Islamiyah (JI). In 2001, we thought that militant activities in the country were under control. However, after we caught militant Yazid Sufaat on Dec 9, 2001, we uncovered a new terror group – the JI. The spread of this militant group’s influence came about from foreign militants who were part of Indonesia’s Pertubuhan Darul Islam (PDI). The history of PDI in Malaysia started in April 1985 when 20 PDI members fled to Klang to escape a clampdown by Indonesian authorities. At first, the group spread their extremist teachings within the Indonesian community there. However, in 1993, a PDI faction broke away and formed JI, which included Malaysian recruits. JI pioneers include Abdullah Sungkar and the notorious Abu Bakar Basyir, who later became the face of the terror group. Both men were from Solo, Indonesia. After JI was formed, Abdullah Sungkar set up the Luqman Nul-Hakiem school in Johor Baru to train the children of JI members. They began recruiting more Malaysians discreetly, with the ultimate goal of forming the Daulah Islamiyah Nusantara. Their first few Malaysian recruits were lecturers from Universiti Teknologi Malaysia in Skudai (Johor) and some Singaporeans. In 1999, Abu Bakar took over the mantle of leadership after Abdullah Sungkar died of complications from heart disease. Since 1993, JI has been using Malaysia as a base for recruitment as well as a transit point for sending their cadets for weapons training in Afghanistan. Around 2000, we discovered that some 40 JI militants used Sabah as transit point on their way to Mindanao (the Philippines) for weapons training. That same year, JI shifted its headquarters from Malaysia to Indonesia when Abu Bakar went back to Solo following the downfall of Suharto’s regime. More JI members headed the same way following the crackdown in Malaysia by the division from December 2001 onwards. Among the locations which we know were targeted by JI were entertainment outlets in Bangsar in KL, the KLCC, embassies, and the Immigration HQ near the Johor Causeway. Was the Special Branch the first security agency to uncover the JI network in South-East Asia? Based on our surveillance of Yazid Sufaat which began in January 2000, it can be said that the Special Branch is the first agency to detect JI activity in the region. Singapore is also one of the earlier countries that managed to uncover and arrest JI members in December 2001. We have also been credited by our counterparts in Australia with supplying information on JI that led to a major crackdown on the group in Australia. Since operations against JI started in 2001, what weapons and explosives have been recovered? We had multiple seizures but never shared them with the Malaysian public before this, as the operations were conducted under the Internal Security Act. One of the most memorable raids was seizing a bomb consisting of a circuit board, remote control, and mobile phone, assembled by JI militant Dr Azahari Hussein in Felda Lengkap in Perak on June 17, 2003. We were led to the bomb by a JI suspect. To conceal it, Dr Azahari had buried the bomb underground along with 14 detonators. Our intelligence revealed that Dr Azahari had mixed dangerous chemicals with explosive materials. So when we finally pinpointed the bomb’s location, no one was brave enough to open the lid, fearing it might be booby-trapped. Even the Hazmat (hazardous materials) team and bomb unit were having difficulties in opening the lid. Finally, the Teluk Intan Special Branch chief ordered everyone to clear the area and opened the lid. Thankfully, nothing untoward occurred. The duo also targeted McDonald’s and other such outlets but, strangely, their first request after being caught was for fried chicken from the fast food joint! Besides JI and al-Qaeda, what other terror groups have crossed paths with the division? One of our successes would be busting the activities of the Liberation Tigers of Tamil Eelam (LTTE), a rebel group in Sri Lanka. Beginning in 2009, we have arrested 25 LTTE militants. One of the most high profile of these was the arrest of high ranking leader Kumaran Pathma-natahan on Aug 5, 2009. We arrested him at a hotel in KL and later transferred him to the Putrajaya police headquarters to prevent any backlash from other LTTE members still in Malaysia. During his interrogation, Kumaran admitted that from Sri Lanka, he fled to Thailand and Singapore before making his way to Malaysia using a forged Indian passport. On Aug 6, 2009, we deported Kumaran to Sri Lanka. Malaysia was once accused of being a transit point for Uighur terrorists from the East Turkestan Islamic Movement (ETIM) originally based in Xinjiang, China. We detected that ETIM has been operating in Malaysia since 2011 following the arrests of 17 Uighurs suspected of terrorism activities. The division has also arrested 32 other Uighurs believed to be involved with the ETIM and using Malaysia as a transit point for terror activities in a third country. We uncovered their modus operandi of entering Malaysia through a human trafficking syndicate. However, it must be said that there are also Uighurs who have entered Malaysia illegally to seek asylum. We also discovered that the ETIM has cooperated with other terrorism groups, including the IS and Abu Sayyaf. It was the ETIM that was responsible for the bombing of the Erawan Shrine in Bangkok on Aug 17, 2015, which killed 20 people. Two Uighurs were arrested following the blast. Some of the ETIM Uighurs have even used Sabah as a transit point as they head to the southern Philippines to join forces with an Abu Sayyaf cell led by fugitive Malaysian militant Dr Mahmud Ahmad. Our operations against the ETIM are ongoing. Is there a comprehensive rehabilitation programme for militant detainees? The rehabilitation of detained militants and religious extremists is organised by the police with assistance from various government agencies. The process begins with the detention order. The detainees are placed under the supervision of the Prisons Department, which has its own rehabilitation programme involving discipline development (up to three months), personality enhancement (six to 12 months), and evaluation by the Prisons Department, the Malaysian Islamic Development Department (Jakim) and the police. During detention in Kamunting (Perak), Jakim is roped in to conduct a series of rehabilitation programmes to instil an understanding of the true teachings of Islam. And former detainees with special expertise are also invited to deliver talks. Who are among the scholars and ulama who have made a difference in rehabilitating militants? Among those who have commanded respect from the detainees are Universiti Sains Islam Malaysia senior lecturer Abdullah Jalil, Islamic Strategic Research Institute senior fellow Engku Ahmad Engku Ali, and Home Ministry Islamic affairs officer Ustaz Zamihan Al Ghari. The most outstanding among them was the late Prof Datuk Dr Muhammad Uthman El Muhammady, a fellow of the International Institute of Islamic Thought and Civilisation. Despite his deteriorating health a few years ago, Dr Muhammad Uthman kept talking to families of detainees all around the country, in Johor, KL, Perak, Sabah, and Selangor. A week before he died, he was still hard at work on his review of reading materials seized in various operations. His son, (International Islamic University lecturer) Dr Ahmad El Muham-mady, also greatly assisted us in the rehabilitation programme. From 2001 to 2012, we conducted rehab for 289 militant detainees with a 97% success rate. Only seven of those detainees went back to militancy. What other programmes are there for detainees? The police is organising a special re-education programme for families of both detainees as well as militants who are still at large. They are invited for dialogue sessions at which all complaints and doubts about matters such as legal procedures are addressed. The next step is the reintegration into society of former militants, which is vital in countering radicalisation and violent extremism. We have to ensure that ex-detainees are able to return to the mainstream of society. Among the steps taken is helping them secure jobs. For the record, several senior JI leaders have become successful businessmen and own several companies. Some are lecturing and many returned to their initial workplaces. We also extended financial help to those interested in setting up small businesses and encouraged the younger ones to continue their education. One successful example of reintegration of militants is the case of 13 Malaysian teenagers who joined an Al Ghuraba JI cell operating in Karachi, Pakistan, in 2003. All 13 were escorted back to the country. Five of them eventually enrolled in universities, some have since become lecturers, a few joined multinational companies, and others became businessmen. What is your advice to Malaysians in the fight against terrorism? The police, especially the division, cannot act alone. Members of the public, NGOs, as well as religious scholars must play their part. Families must be wary of their surroundings and report suspicious activities to us. The division will always be on guard. As for the current IS threat, we have detained 294 militants since February 2013. The safety and security of everybody is our priority. 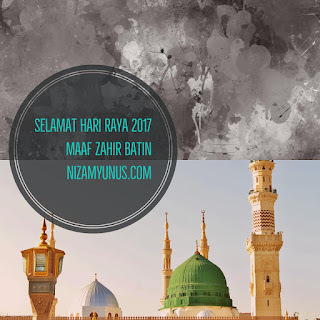 nizamyunus.com mengucapkan kepada semua pembaca blog ini Selamat Hari Raya Aidilfitri dan Maaf Zahir dan Batin. Ini merupakan entri pertama menggunakan HP Slimline 270 P005D. Berkuasakan Intel i5, PC ini akan menggantikan PC ofis saya yang akan tamat sewaan tidak lama lagi. 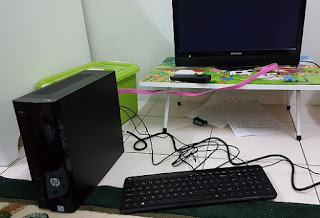 Saya baru membelinya petang tadi dan buat masa ini, PC comel ini akan berada di rumah untuk saya jalankan proses setup dan installation dari cloud. Di rumah lebih laju kerana menggunakan Unifi. Buat masa ini, saya hanya beli PC sahaja tanpa monitor kerana saya telah mempunyai monitor HP yang pernah saya gunakan sebelum ini. Di rumah, saya sambung dengan TV LED Toshiba saya seperti gambar diatas menggunakan kabel HDMI. Ada sedikit masalah kerana resolusi TV ini agak sukar dipadankan dengan grafik Slimline, tapi buat sementara ini, boleh lah. So far, malam ini menggunakan wired mouse and keyboard dari HP. Masih ada beberapa software yang perlu didownload untuk menjadikan ianya sesuai digunakan. 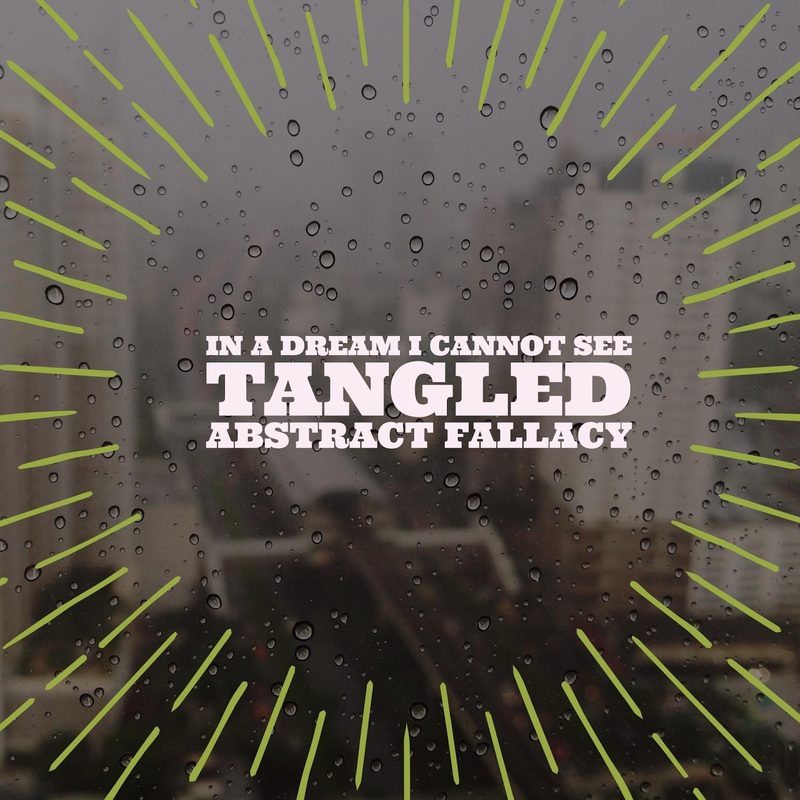 From 'Addicted To Chaos' Megadeth. Bulan lepas saya sekali lagi menggunakan Lazada untuk membeli produk. 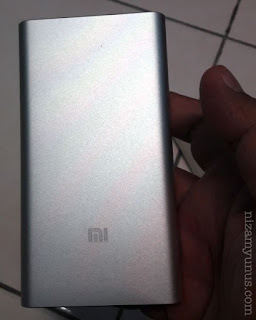 Kali ini buat pertama kali saya beli produk Xiaomi dari Official Store mereka di Lazada. This is the first time saya beli di Official Store. Sebelum ini pernah juga saya beli di official store tetapi terus di website pengeluar itu sendiri. Untuk produk Xiaomi ini, saya order pada hari Rabu dan sebelum waktu solat Jumaat produk ini dah sampai di rumah. Saya beli Mi Power Bank 2 10000 mAh dan USB Led Light, dapat sekali USB Fan. Harga powerbank adalah Rm 85 sementara USB Led Light set beserta USB Fan adalah RM 34. Kesemua produk datang dengan waranti. Perlu diingat, ini adalah barang authentic dengan warranty dari official distributor kerana saya beli di Official Store menggunakan platform Lazada. So no issues regarding authenticity here. Lagipun saya dah check di website Xiaomi dan produk ini adalah asli. Diatas adalah gambar Mi Power Bank 2 ini selepas dibuka dari postage packaging yang sangat kemas. Kotak Power Bank ini adalah chinese packaging dimana tulisannya adalah dalam huruf karakter cina. Ini adalah rupa bentuk powerbank tersebut setelah dikeluarkan dari kotaknya. Bentuknya mudah dipegang dengan sebelah tangan. Ada dua varian warna iaitu hitam dan silver. Saya pilih varian silver. Logo Mi di embossed pada casing powerbank. Nampak kemas dan terasa berat. Ketebalannya adalah 14mm. Untuk perbandingan, ketebalan iPhone 7 adalah 7mm dan Samsung A7 2016 saya adalah 7.3mm. Hampir sekali ganda tebalnya powerbank Mi ini dari handphone saya tapi lebih nipis berbanding powerbank Pineng saya yang saya anggarkan mempunyai dua kali ganda tebal dari handphone saya. Terdapat port yang biasa ada di powerbank lain iaitu charge in dan charge out port. 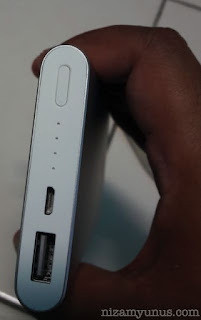 Cuma di powerbank ini, hanya ada satu sahaja port untuk charge out, tak seperti power bank Pineng saya yang ada dua port iaitu satu port 1v dan satu lagi 2.1v. Untuk powerbank Mi ini, satu port adalah memadai untuk kedua-duanya. 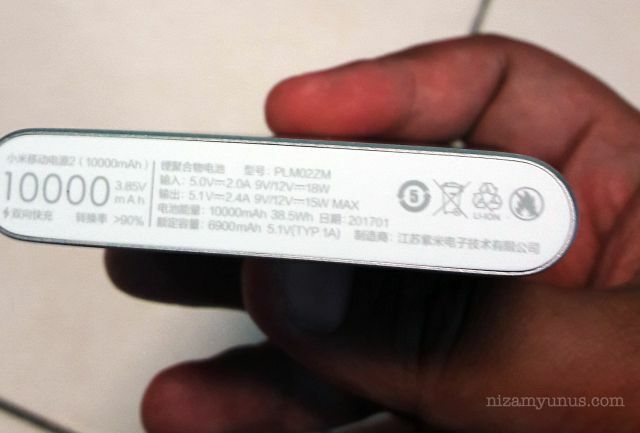 Menurut website Xiaomi, powerbank ini cukup pintar untuk menentukan samada device yang di charge memerlukan kekuatan 1v atau 2.1v. Cuma jika charge low power device macam bluetooth headset, kita perlu tekan button yang kelihatan di kanan gambar diatas 'dua kali' atau double press supaya powerbank kenal low powered device tersebut. LED indicator untuk menunjukkan jumlah kuasa yang masih terdapat dalam powerbank adalah old school iaitu hanya ada 4 lampu. Dalam hal ini, Pineng saya menang kerana mempunyai LED display yang memaparkan figure percentage untuk memberitahu pengguna jumlah kuasa yang masih tinggal. Di sini, Mi powerbank ini nampak sedikit old school dan ketinggalan zaman. Ini pula spesifikasi powerbank yang ditulis di bawah casing. Tulisan sangat jelas dan nampak berkualiti. Yang saya faham cuma tulisan 10000mAh dan logo. Ini pula USB Led Light dan USB Fan. Saya beli sekali dengan harga RM 34 dari Official Store yang sama saya beli Mi Powerbank 2 tadi. Order pada waktu yang sama dan tiba juga dalam packaging yang sama. 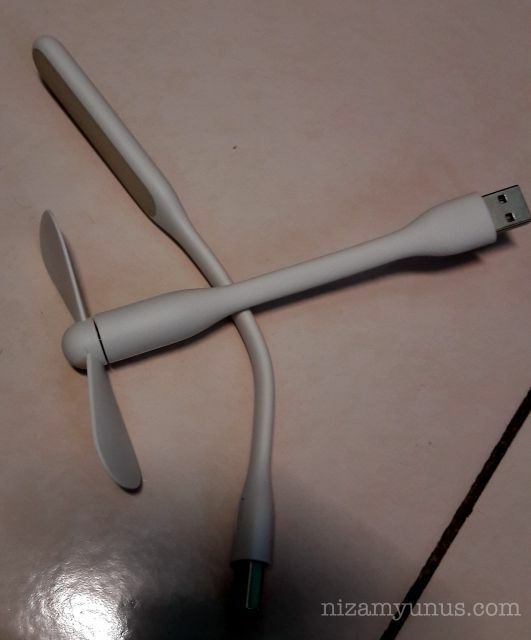 Saya bukanlah nak sangat USB Fan ini tetapi oleh kerana ianya included dalam set USB Led Light, so ambik sajalah. USB Led Light dan Fan ini boleh digunakan bersama-sama powerbank yang bukan dari jenama Mi, cuma untuk Pineng, apabila saya pasang di port 2.1v, USB Led Light akan off sendiri setelah beberapa saat. Bila pasang di port 1v sahaja dia stay on. Kalau di Mi Powerbank 2 yang sememangnya ada satu port sahaja, ia akan stay on. Mungkin betul juga kata Mi yang port powerbanknya cukup inteligen. Kedua-dua device USB ini juga boleh digunakan di USB Port PC atau Notebook. Saya belum pernah try lagi. Belum ada keperluan. 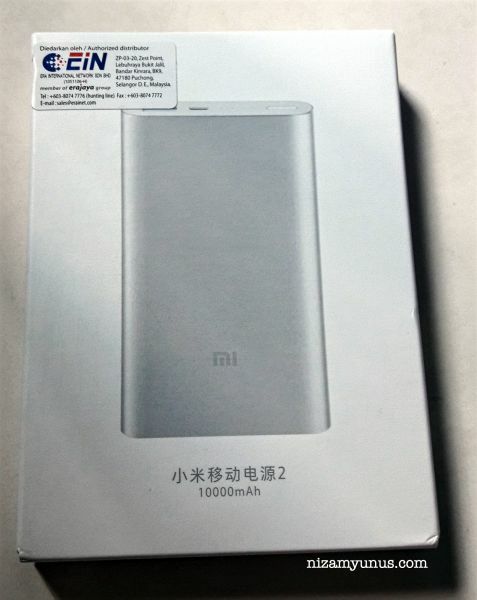 Menurut website Xiaomi, Mi Powerbank 2 ini merupakan device yang two-way fast charging. Ia akan fast charge handphone yang support fast charging dan powerbank ini juga akan fast charge dengan lebih cepat. Ia juga dilengkapi dengan aluminium casing. Powerbank ini dilengkapi dengan High Density Lithium Polymer batteries. Senang cerita, penggunaan bateri Lithium Polymer lebih selamat dari penggunaan bateri Lithium Ion kerana ia adalah lebih tahan dari overcharge, menjadikan ia lebih sukar 'meletup' dari Lithium Ion. Lithium Ion memerlukan cip tambahan untuk menjadikan ianya selamat. Lithium Polymer juga lebih ringan. Mi Powerbank 2 ini juga mempunyai 9 layers of world class chip protection. 9 layer tersebut adalah temperature resistance, input overvoltage protection, output overvoltage protection, protection from short circuit, protection from incorrect insertion, protection from overcharge and overdischarge, reset mechanism, PTC protective circuit for the cell dan protection from output overcurrent. Secara ringkasnya, ciri-ciri ini merupakan ciri-ciri yang perlu ada pada semua powerbank. Sebenarnya saya beli Mi Powerbank 2 ini adalah kerana kemampuan untuk fast charge device saya (yang support fast charging sahaja ye) dan juga fast charge powerbank itu sendiri. Saya telah test sendiri di mana powerbank ini lebih cepat di charge. Saya tidak pasti berapa lama kerana saya kerap tinggalkan powerbank untuk di charge, tetapi yang pasti amaun masa yang diambil untuk fully charge adalah lebih cepat dari powerbank lain. Maaf saya tiada correct figure kerana testing environment powerbank ini pun tak berapa lengkap dan sesuai, cuma the bottom line is I felt it was faster than my Pineng 10000 mAh. Kalau saya yang nak tengok Mi Powerbank 2 ini diuji, boleh baca di sini. Forum user di link itu ada membuat charge test ke atas Mi Powerbank 2, which also includes technical jargons. Yang paling penting adalah ia mampu fast charge my smartphone hampir sama dengan menggunakan original Samsung Fast Adaptive charger. Yang ini memang saya dah test, cuma the accurate amount of time to saya tak pasti, but it works fine doing its job fast charging my device. USB Led Light pula saya beli kerana saya suka membaca di malam hari ketika bilik sudah ditutup lampunya. So, LED light ini is very useful as a reading light. Before this baca guna device, tapi lama-lama tak tahan juga walaupun ada blue filter di device saya. USB Led Light amat terang, dan boleh di adjust dari mode cahaya yang manja sehinggalah ke yang amat garang. 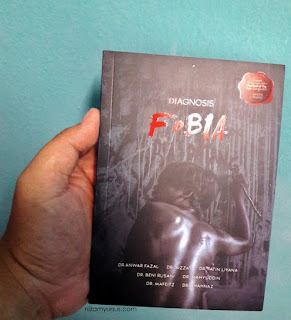 Buku ini saya beli pada 24 April lepas, menarik bukunya, ditulis oleh sekumpulan doktor-doktor dan kisah di dalamnya adalah 100% misteri dan 90% adalah kisah misteri di hospital. Gaya bahasa dan penceritaan adalah menarik dan adakalanya santai seperti membaca blog. Some of them even wrote in full English, some in 99% Malay and some are using mix language, like this blog. Overall, this book is good to read. 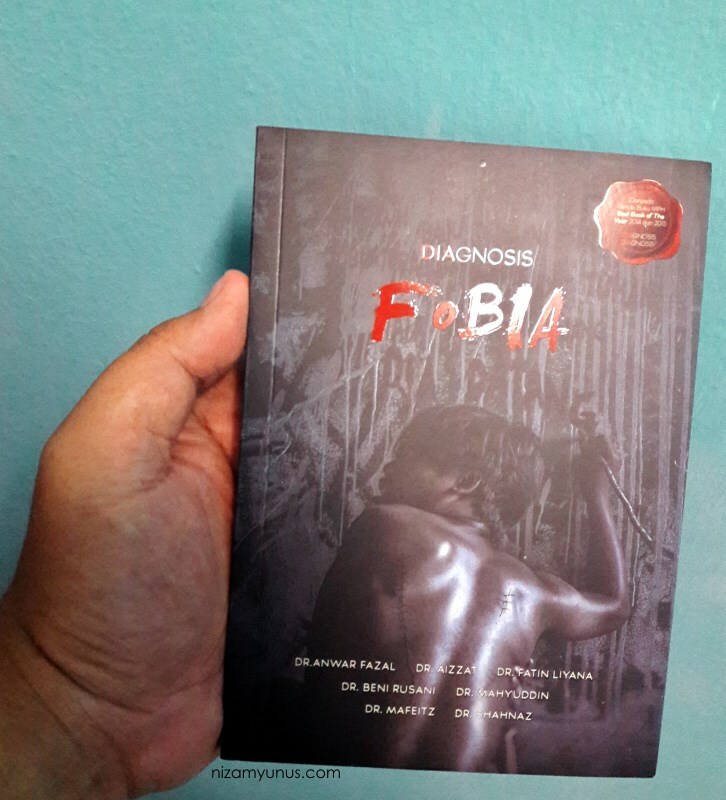 Actually this is the third installment of the Diagnosis series, all written by a group of doctors. Yang lagi dua which is the earlier series, saya tak beli lagi, will buy soon. My first was the latest series. 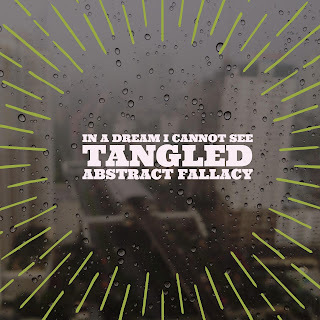 One of the writer is Fatin Liyana, dimana blog beliau kerap saya baca.